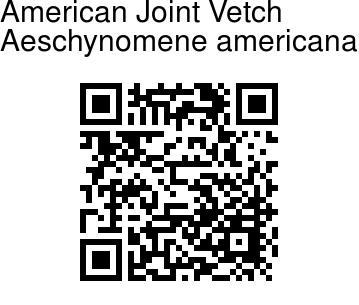 American Joint Vetch is an upright herb, 1-2 m tall, which is a short-lived perennial. Stems are hairless, upper sections hairy, usually glandular. Leaves 3-7 cm long. Leaflets 8-38 pairs, 5-15 mm long, 1-2 mm wide, linear or linear to oblong, sensitive, folding together when touched. Stipules persistent, linear-lanceolate, 1-2 cm long. Inflorescence is a loose, often branched, few-flowered raceme. 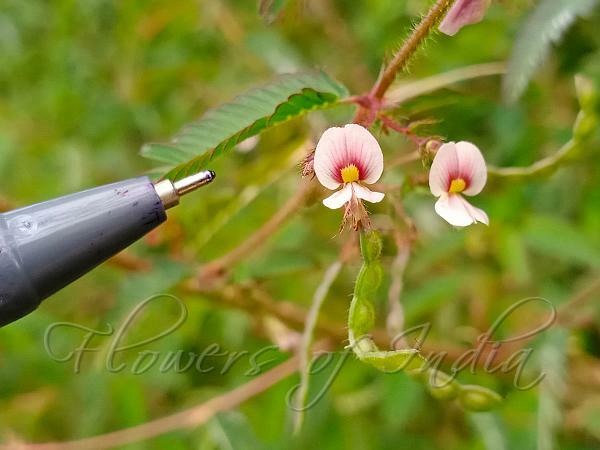 Sepal tube is about 4 mm long, deeply two-lipped. Flowers vary in color from white tinged with mauve or light violet to purple to flesh colored, sometimes pinkish orange, 0.6-1 cm long. Pod usually slightly curved, four to eight jointed, up to 4 cm long, the upper margin entire, the lower deeply indented at each segment joint; each segment one-seeded; semi-circular, about 4 mm long. Seeds grey-green to dark and light brown. Identification credit: Dinesh Valke Photographed at Kharghar Hills, Navi Mumbai, Maharashtra.